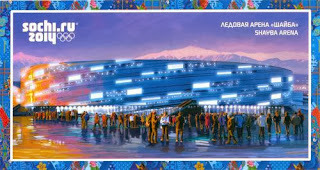 Postcard RU-2282790 from Russia shows the 2014 Winter Olympics that starts today at Sochi, Russia with opening rounds in Figure Skating (Team – Men Short), Freestyle Skiing (Ladies' Moguls – Qualification), and Snowboard (Men's Slopestyle – Qualification). The Opening Ceremony will be held at 8 pm local time (8 am PST or 11 am EST) tomorrow on February 7. There are 98 events to compete in 15 winter sports through February 23, 2014.